Eye patches are generally worn for medical reasons. It is important to note; diagnosis is made for the wearing of an eye patch by a doctor. 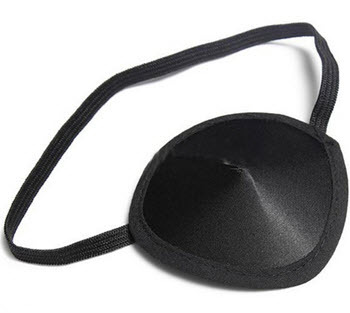 There are many reasons doctors diagnose wearing eye patches, and they are usually made of leather or a cloth material which is held in place with a string or an elastic band. Other bandages are made of plastic that is kept in place by clipping them to the lens of a pair of eyeglasses, and there are still others that are made of adhesive that is placed over the eye like a band-aid. Medical issues like “lazy eye” or Amblyopia, which is a situation of one eye not functioning as it should, is one reason. By wearing the eye patch on the good eye, it gives the Amblyopic eye the chance to strengthen the muscles and it gets accustomed to doing the work as well as the good eye. This treatment is generally for children when this condition is discovered. Some kids have issues with being teased by their peers about having to wear a patch, so other treatments may be used to correct this condition. Double vision or Diplopia is another medical condition that warrants the use of an eye patch. The symptoms are blurred or double vision. This condition occurs with people who suffer from Vertigo, dizziness, and nausea. Other medical conditions that warrant having to wear an eye patch include, having lost an eye in an accident or losing an eye from a disease. There are also other reasons that people wear eye patches that are not necessarily medical, but practical. You can read more about the medical reasons to wear eye patches on http://www.linser.com. It is known that commercial airplane pilots used to wear an eye patch to cover their eye when having to fly in the dark; it helps their eye to become accustomed to the dark especially when flying over cities that are brightly lit and have the need to see the instruments in the dark cockpit. This practice helped pilots, but it is advised by the FAA nowadays that pilots close one eye while flying at nights and use a light in the cockpit. This exercise helps to preserve their night vision for reading instruments. Military pilots will wear special eye patches lined in gold or lead which could potentially protect their eyes from particular types of attacks while flying through dangerous territories. Historically, eye patches were worn by pirates for the same reason as pilots to get their eyes acclimatized to the dark if they have to go below deck. The blacksmiths of old would wear eye patches as well to protect their eyes from the damage of sparks when working. Most people who wear eye patches do so for medical or practical reasons, but there are also a small number of unpractical reasons that people have decided to wear eye patches. 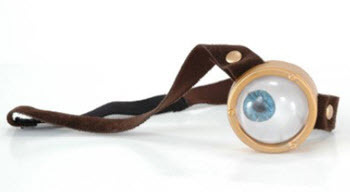 A rather common unpractical reason to wear an eye patch is as a part of a halloween or masquerade custom. The eye patch completes the look. This is a weird story but we have been told that there have been several attempts made to use eye patches to cheat in casinos. The eye patches contain technology that allows the cheater’s partners to communicate with him without anyone knowing. This technique enables card counters to tell their heavy better when a deck is hot so they can sit down at the table and bet large. A hot-deck favors the gambler. Being able to communicate in secret makes it easier to win money counting cards. If you do not already know, then you can learn more about card counting and how it works here. We do not know how common this practice is. We do not know how many have tried this technique in different casinos without getting caught and we do not know how many that have gotten caught since most casinos keep this information secret. They do not want any bad PR. We only know of the practice from people who work in the casino industry. We can see the benefit of being able to communicate this way and how it would make it easier for a card counting team to make money but still thinks it is incredible that anyone tried it. To us, it just sounds like the exam scene in the 80s comedy, Spies like us.